For a long time, I had the notion that webpack could only be ran for set ups that are independent from the back end. For example SPAs that only communicate with AJAX. I closed my mind into thinking that it had to be ran with a development server. You would make the webpack config file and use that to run the dev server. That would do all the cool things like Hot Module Replacement and having all the JS in RAM so changes would be blazing fast. Then, when you needed to actually use it for production, you would do a build and be done with it. I blame the tutorials and webpack docs partly, because when I started looking into webpack around 2 years ago all the examples where like what I mentioned before, independent set ups. So the only time I used webpack was for personal projects. But on my professional projects I would use gulp with require/browserify/jspm whatever was in flavor besides webpack. Until I came across a project that used it the way I wanted to. You can use webpack to develop in a set up where you have the back end connected with the front, for example with a templating language. All you need to do is define an input file and output directory in your webpack config. Then you run webpack -w and that’s it. It will watch for changes, and then do what it does, and throw it to the output directory you specified. After that, you just point to the output file in your template like <script src="./build/index.js" />. This project does just that, as simple as possible. 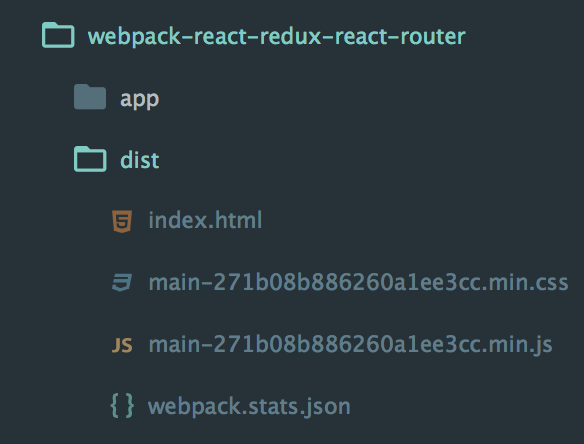 You won’t benefit from HMR, but at least you CAN use webpack for these connected set ups which are much more common in the professional world. Webpack can be simple too. I went ahead and created a very simple example for you. Click here to download it through github. this will bundle what’s in the entry file and its imports and output it in the /build directory. This is all webpack needs to do its job. An entry place to your app, and where to output the generated bundle. That’s it. A boilerplate for playing around with react, redux and react-router with the help of webpack. a working example of a filterable table which you can play around with (look below). Yes, it takes a while to load the first time you open the app. Is the hot module replacement really working? The app updates without the browser having to reload. You don’t lose state! This will build the app into the “dist” directory in the root of the project. It contains the index.html along with the minified assets, ready for production. It should look something like the above image. Why doesn’t it have async? Understanding a simple react, redux and react-router app in es2015, part1. Here, we will cover the routes configuration, the actions and all the react components starting from the Root. Understanding a Simple React, React-Router and Redux Application in ES2015. Includes Hot Module Replacement and much more. Tutorial: Webpack setup using React, React-Router and Redux for developing Front End applications. Includes Hot Module Replacement and much more.